Live on stage these companies representatives stated their clear commitment to go even further. Additionally, representatives from BMW, Daimler and Volkswagen underlined the need for this step. The Code of PLM Openness (CPO) is the foundation for Daimler’s PDM strategy and serves as the basis for the externalization of business objects from all IT applications to a service-oriented middleware. This is a key driver for an IT system landscape with different development speeds and release cycles, whereby the implementation of the Digital Twin, the introduction of model-based Systems Engineering as well as the delivery of IT for Autonomous Driving will be enabled. monolithic systems – requires huge efforts and costs. Hence the extreme importance for Volkswagen for the assurance of interoperability, supportability, cost effective maintainability and scalability of the implemented systems. It is planned to offer the accredited certification program from 2018 in. In parallel, to the related measures and as an additional step for leveraging the international acceptance of the CPO certification the related documents will be published as the DIN SPEC 91372 series. 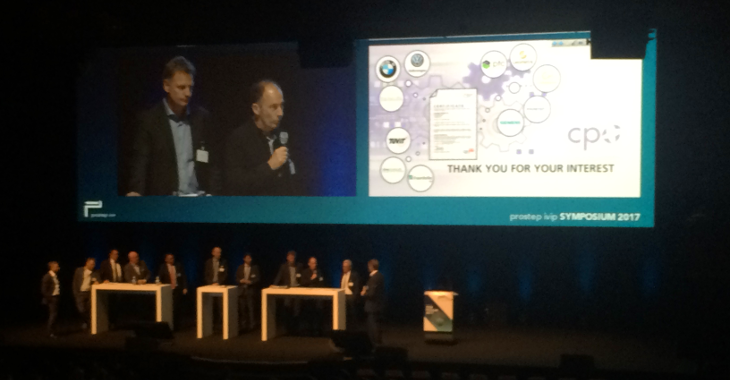 Review: prostep ivip symposium 2016 - A Total Work of Art!